Wilbur Cohen was born in Milwaukee, Wisconsin. He graduated from the University of Wisconsin in 1934 with a degree in economics. After completing his university studies, Mr. Cohen went to Washington, D.C. to work as the research assistant to the Executive Director of the Cabinet Committee on Economic Security, which drafted the original Social Security Act. In 1935 he was the first employee to join the newly established Social Security Board, predecessor to the Social Security Administration, where he worked as a technical advisor until 1952; and from 1953 to 1956 he directed Social Security's Division of Research and Statistics. 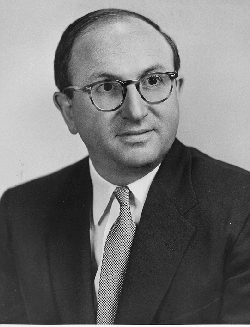 In 1956 Mr. Cohen left Government service to take a position with the University of Michigan at Ann Arbor. He took a leave of absence from the University of Michigan in 1961 when President Kennedy appointed him Assistant Secretary for legislation in the Department of Health, Education, and Welfare. In 1965, President Lyndon Johnson named Mr. Cohen Under Secretary of DHEW, and in 1968 he was appointed Secretary of DHEW, a position he held until 1969.